Moons feature in many of Ansel Adams photographs. It is difficult to take photographs including the moon where it doesn't either appear as an over-exposed white disc, or if a negative giving this is manipulated at the printing stage, a featureless grey disc. By 1960 Adams was sufficiently skilled in anticipating exposure, in his visualization of his images and in the practical application of his zone system, that his photographs including the moon could show the moon in detail and as a three dimensional object. This picture was taken one winter afternoon during a stop while driving towards the Ahwahnee Hotel in the Yosemite Valley. The moon rising above half dome as the shadows of the setting sun were creeping on the dome's 2000 foot cliff drew attention to a picture that could not be missed. The moon here is gibbous - between half full and full. Adams was using a spot light meter with an angle of view of only half a degree so he was able to take a light reading from the moon alone in the scene and placed it in zone VII of his system. As so often a coloured filter was used to darken the sky relative to other parts of the picture - black and white film tends to be more sensitive to blue light and so photographs including the sky that we perceive as dark come out with the sky being very bright and featureless. On this occasion a strong orange filter was used, the camera being a Hasselblad with a 2 1/4 in square (6cm) negative. This camera being smaller than the 8 x 10 in and 4 x 5 in view cameras usually used, was quicker to set up and use, and more pictures could be taken readily on the film that is stored in the camera on a roll. The camera was set up on a tripod and the mirror locked out of the way (the Hasselblad is a single lens reflex camera where the photographer views the scene through the taking lens via a mirror which flips up just before the film is exposed) to prevent camera shake during the exposure. Several exposures were taken with different lenses and Adams made his usual notes regarding the development of the film to suit the conditions and his visualization of the final printed image. 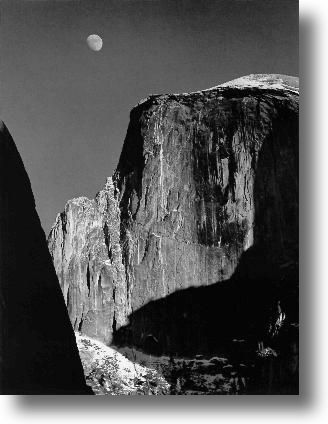 Adams photographed Half Dome many times in his career and it appears in many of his most famous pictures. He said that despite this "..it is never the same Half Dome, never the same light or the same mood". Changes in lighting, perspective, cloud and weather change such great features of the landscape so that while familiar, they are forever capricious.